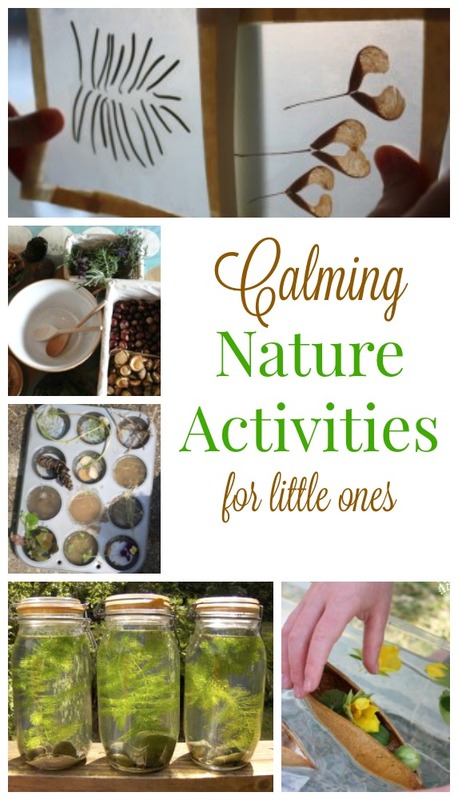 I have found that exploring nature items is very calming for my little ones.Our newest rhythm is really focusing on calming activities for kids (Speaking of which, have you discovered Clever’s New Trick? It’s a social story I wrote about helping little ones learn to calm down. You can read more about it by clicking here.) And so, I had thought of this old post – and thought, perhaps you might like to re-visit it as well? I love being outside with my kids. We go outside every single day. I feel it is a relaxing and recharging time for them, being outside and active in nature. But of course we are not outside all day. So when we are not, I love to bring the outdoors in. Indoor nature activities for kids are full of learning and sensory exploration too – so many benefits for wee ones! 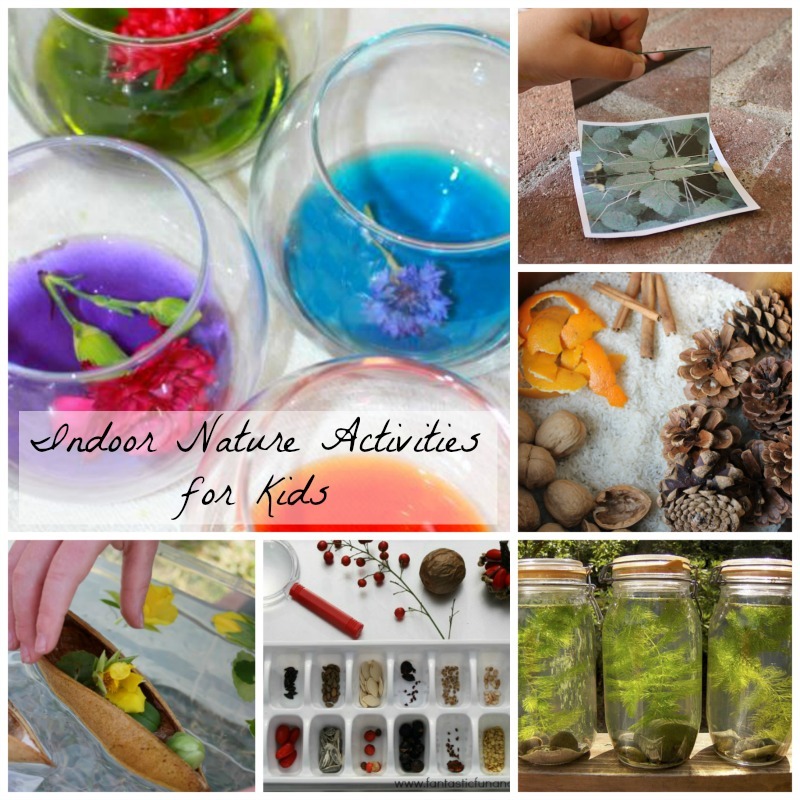 I selected these indoor nature activities for kids from some wonderful blogs – many of which have lots of ideas for nature play, inside and out! 1. 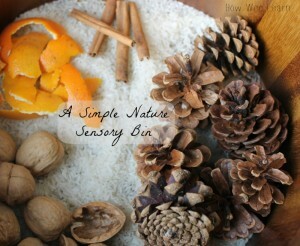 I thought we would start of with our natural sensory bin. 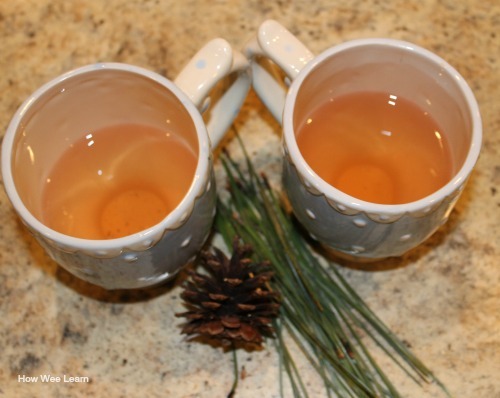 It is a favourite activity of mine (I mean … of my kids …) as it is so relaxing and calming. 2. 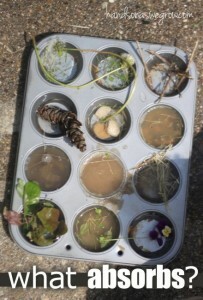 My Nearest and Dearest brought the outdoors inside with her sink or float sensory sink. Such a beautifully simple idea to do any time and any season! 3. Have you ever made a biosphere? It is on my to-do list with my kids very soon. And I hadn’t realized how simple it was! 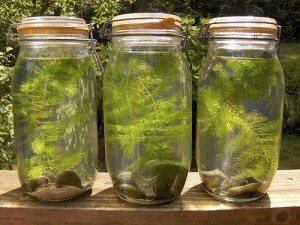 Makezine.com shows how very simple making a biosphere with kids is! 4. A wonderful way to explore and create with nature is by making these gorgeous, vibrant water colours. Learn, Play, Imagine has a great tutorial. 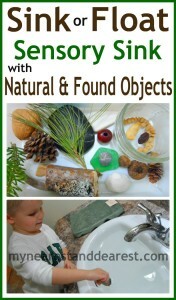 What a fun indoor nature activity! 5. 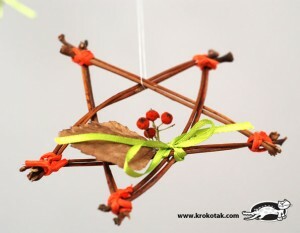 These gorgeous nature stars are from Krokotak. They are made from chestnut leaf stalks, but grapevine, or even bendy twigs would work too. One of my big focuses with exploring nature indoors is keeping things simple – whatever we have close by is what we will be bending into these beautiful stars!! 6. 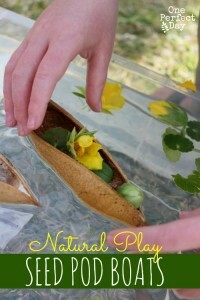 Sun hats and Wellie boots has tons of wonderful nature activities for kids! 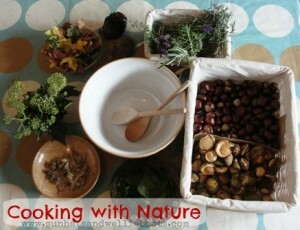 This lovely idea uses nature items for some imaginative play in the kitchen. 7. 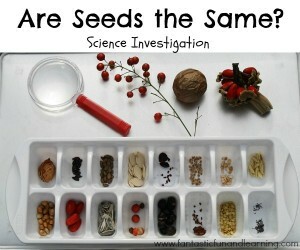 I love how Fantastic Fun and Learning explored seeds over many days. Collecting and gathering and then comparing too. ‘Are the Seeds the Same?’ is a wonderful indoor nature activity! 8. My kids always want to keep their nature treasures. This beautiful idea by Still Parenting will be put to great use in our house! 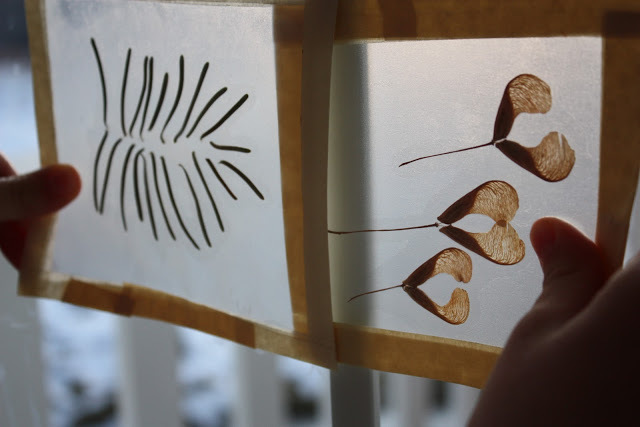 Making gorgeous light or sun catchers from nature items. 9. Learning about absorption is so much fun for kids (truly … it was always an amazing hit in my Kindergarten classes!) I love this twist by Hands on as we Grow – exploring what nature items absorb water. 10. When we stop to look, nature is truly amazing. So many of the math, science, and language concepts we want our children to learn can be taught very naturally. 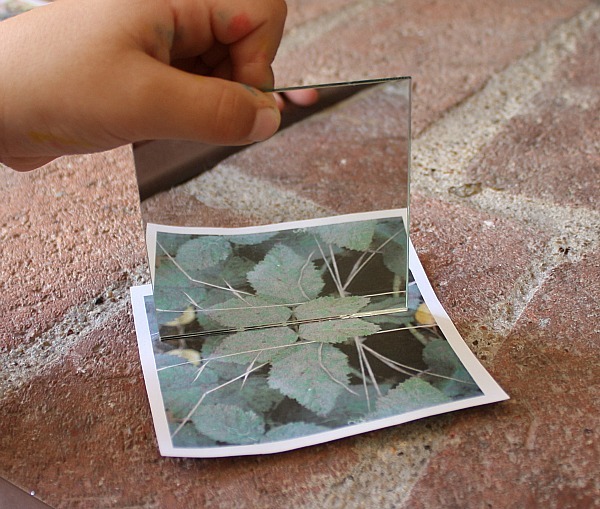 Buggy and Buddy did just that as they explored symmetry in this indoor nature activity for kids. 11. Creating with nature is something we love to do. We have made little boats from walnut shells for our gnomes journey, but I have never thought to turn seed pods into boats! What a wonderful idea by One Perfect Day! 12. This activity of ours was so much fun. It did start with an outdoor nature walk and exploration, but the very best part was done indoors. Here is how we explored the sense of taste with our nature walk. Being outside is wonderful for kids. And bringing the outdoors inside is the next best thing! These indoor nature activities for kids are full of learning, imaginative play, and creativity for your wee ones! And, they are pretty fun for big people too. I will keep adding indoor nature activities as we post them to How Wee Learn, so you can find them all in one spot! Thank you for reading friends, I hope you are having a lovely week. Please consider following us on Pinterest so we can share more creative learning activities with you and your wee ones. « Ridiculously Fun Outdoor Games for Kids! wow, Sarah, what a fantastic round up! You did a really great job of selecting a wide variety of activities. I’ll definitely refer to this list when I’m in need of a little inspiration. Thanks Ann – I am eager to try your sink or float sink – I bet my wee ones will love it! This makes me long for spring, but we still have another 3 or so months of snow yet… *Sigh. But I’m going to pin this so I can remember them when spring and summer come around again Thanks for sharing! Nice to think of spring on some winter days though – right? Thanks for commenting Missy! Wow I love the idea of bring nature inside. 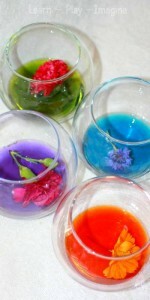 Thank you for including our flower watercolors! Love that post Allison! Thanks for stopping by!